How are animals part of the history of Northwest Arkansas? Humans have depended on animals for millennia. 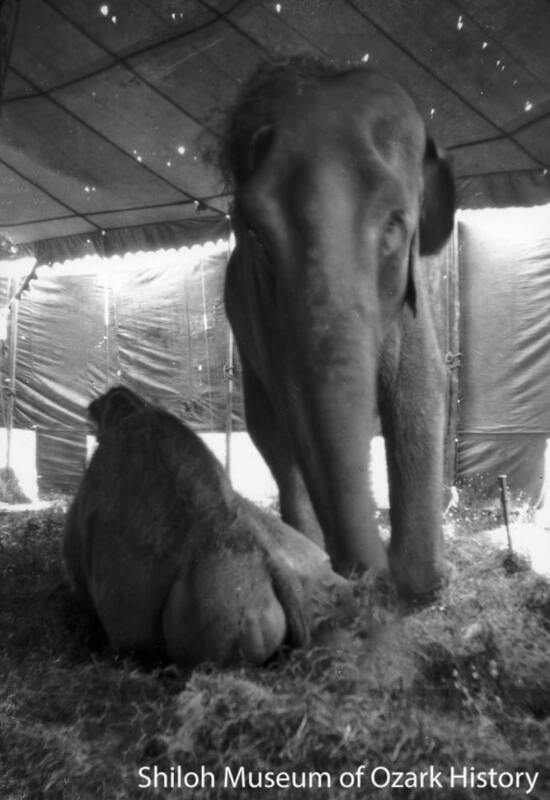 We have shaped them through breeding and domestication and through transformation of their environment. And they have shaped us by the ways we use them and how we think about them—as natural resource, food, laborers, transportation, entertainment, athletes, and companions. Native Americans—During the 1700s Osage Indians traveled south from their homes in what is now western Missouri to the Arkansas Ozarks in part to hunt game. Bear, elk, deer, bison, and small game animals were used for meat and leather, some of which, along with bear oil, was traded to other Native American tribes and Europeans. Settlers—When white settlers moved into the area in the early 1800s, they relied on local wildlife for food and leather and fur pelts for trade. Dr. Alvah Jackson is said to have had a bear-fat rendering plant in the 1820s or 1830s in Carroll (now Boone) County, near the mouth of Bear Creek. The rendered fat was used to make oil lamp fuel, lubricants, and even hair gel. Farmers worked hard to kill wolves, panthers, foxes, and other predators to protect their livestock. 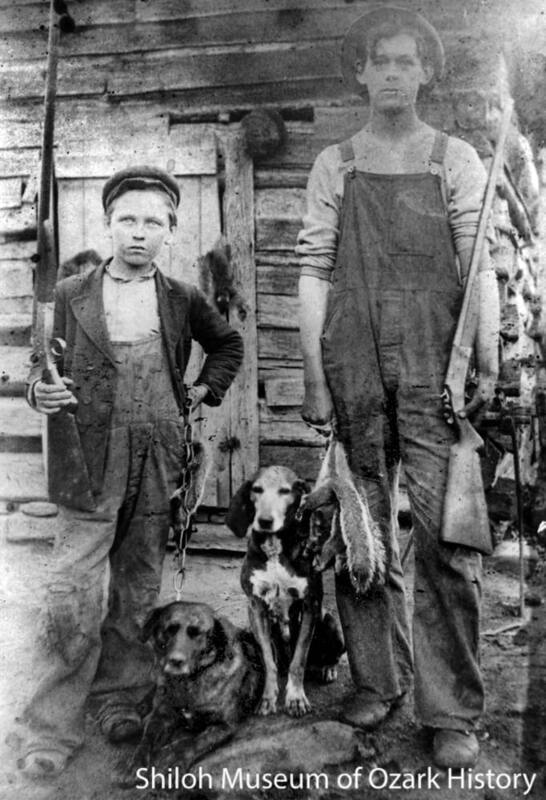 In 1893 Bill Young promised that, if elected Benton County circuit clerk, he would “buy a good set of hounds and let the boys hunt with them.” He won, brought in hounds from Tennessee, and drew up the bylaws for the Northwest Arkansas Fox Hunters Association, the oldest such group west of the Mississippi River. Overhunted—By the mid-1800s the buffalo herds of Benton and Washington counties were gone due to hunting and loss of habitat as the prairies were transformed into farmland. Overhunting continued and by the late 1800s the region’s game population was in serious decline. During the Great Depression of the 1930s game animals were scarce, making it hard for folks to supplement their food supply. 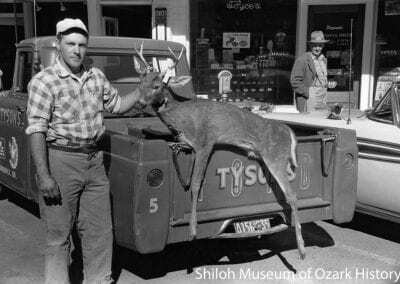 In 1938 about 200 deer were harvested legally statewide. Conservation—The Arkansas Game and Fish Commission was created in 1915 to establish regulations and issue licenses to hunters and fishers. In later years the Commission worked to improve and rebuild habitat and wildlife species. An elk herd was reestablished in Boxley Valley near the Buffalo River beginning in 1981. State fish hatcheries produce walleye, crappie, trout, largemouth bass, and other fish for stocking in area lakes and waterways. 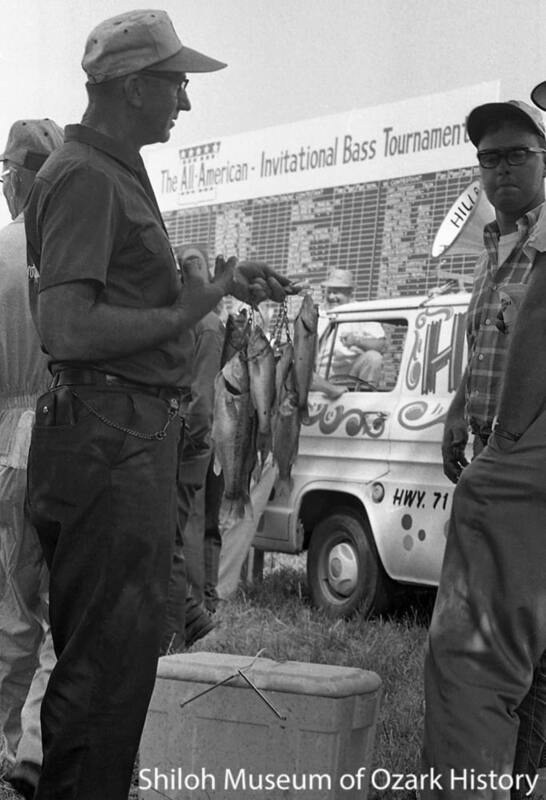 The coming of Beaver Lake in the mid-1960s gave rise to fishing competitions such as the All-American Bass Tournament, first held in 1967. 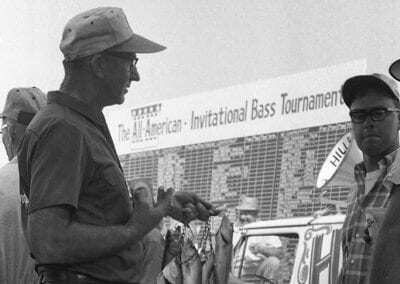 Organized by Ray Scott of Alabama, the tourney attracted 106 of the nation’s top anglers, who competed for the grand prize of $2,000 and a weeklong trip for two to Acapulco, Mexico. While the largest fish caught were kept for trophy mounts, the rest of the fish were donated to area charities. Protection—Today, ongoing challenges include wildlife moving into urban areas, chronic wasting disease in deer and elk herds, and an expanding feral hog population. Organizations like the Northwest Arkansas Land Trust are taking action to help conserve wildlife habitat in a rapidly developing region. 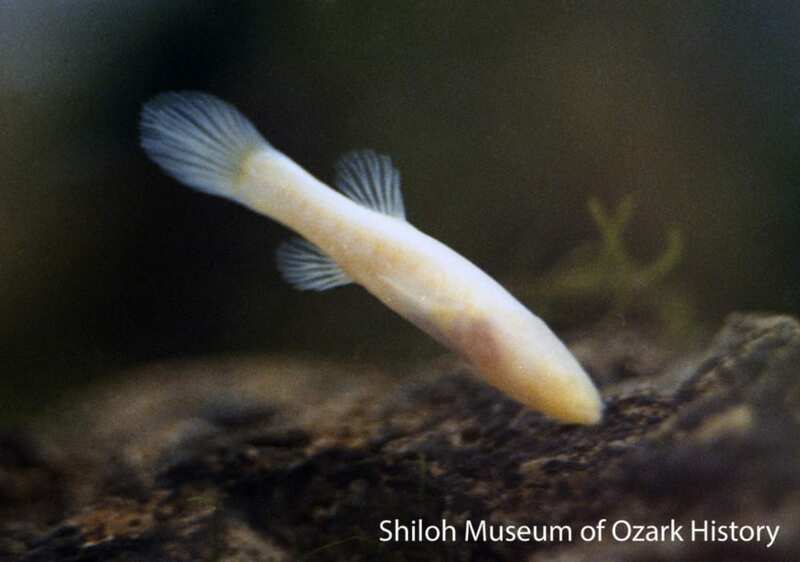 Ponds built along Interstate 49 near Lowell are meant to filter possibly polluted runoff water in the recharge area for the endangered blind Ozark cavefish. The fish evolved in near-total darkness, where there was no need for working eyes. Injured wildlife are cared for by certified rehabilitation facilities, which work to educate the public about the important role wildlife plays. 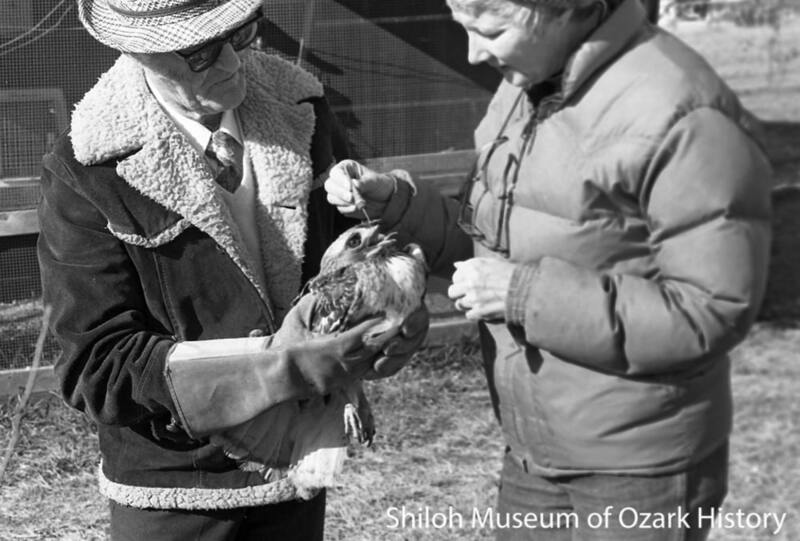 The operators of Vi-Jo Wildlife Haven in Siloam Springs relied on donations and treatment by volunteer veterinarians, but often paid for the haven’s operations themselves, picking up fresh road kill with which to feed their patients. 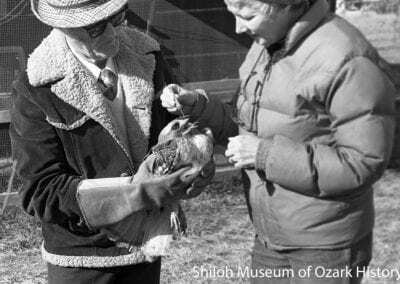 When they retired in 1988, their mission was picked up by Lynn Sciumbato, who started Morning Star Wildlife Rehabilitation Center in Gravette. Today she treats 400 to 500 animals and birds each year. Early Residents—Early settlers to Northwest Arkansas brought with them what they needed to survive on the frontier, including livestock. 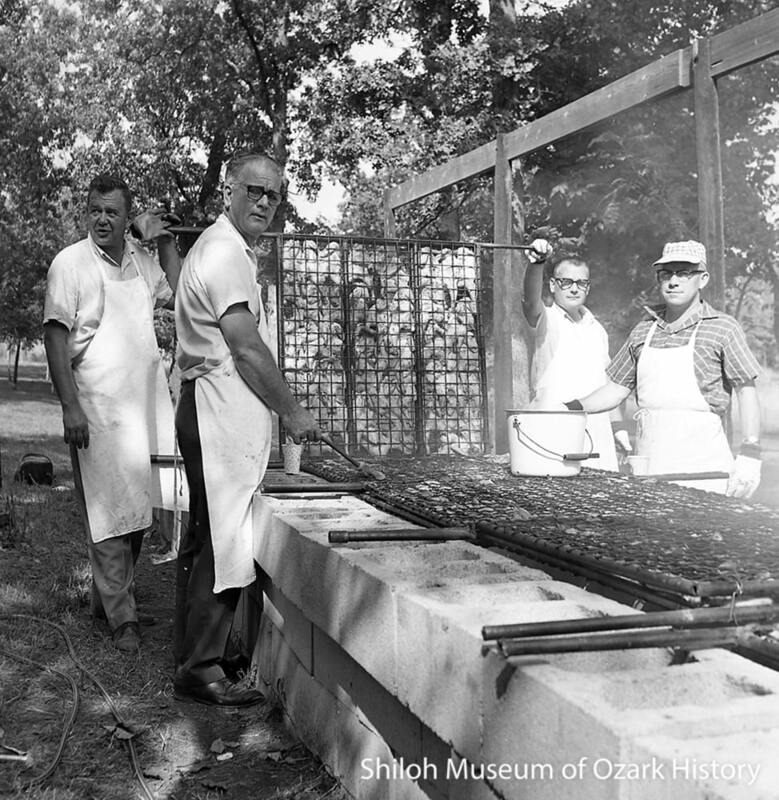 Hogs were especially important because, in the days before refrigeration, the meat could be preserved with salt and smoke. Although most livestock was raised for home use, some animals were taken to market. In 1853 a crew of drovers took 550 head of cattle from Washington County to northern California to supply fresh meat to growing communities. 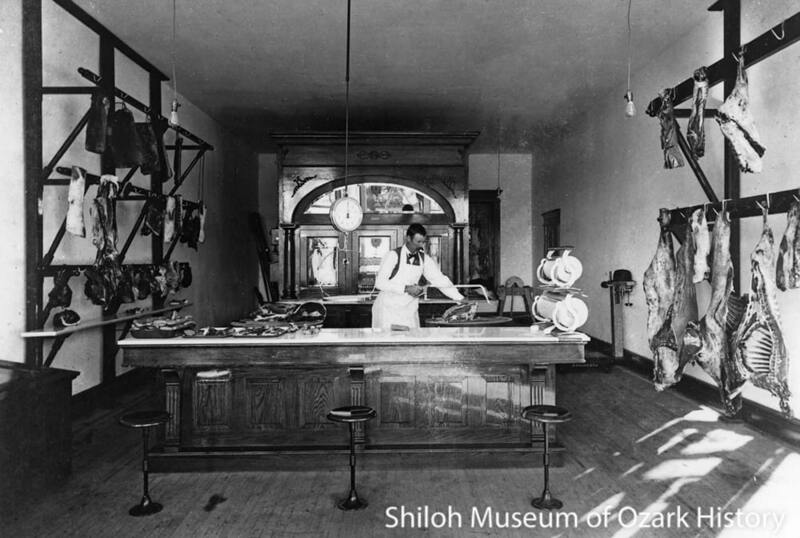 As the area became more urban, local meat was sold in area butcher shops to families who lived and worked in town rather than on a farm. 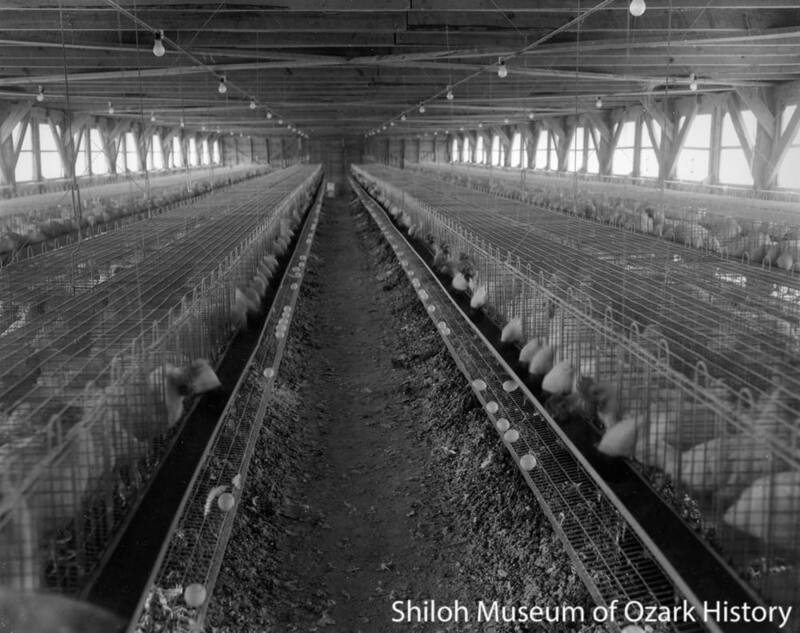 Poultry Industry—During the 1920s Jeff Brown of Springdale began experimenting with young chickens (broilers), examining breeding, diet, and how best to hatch them in an incubator. 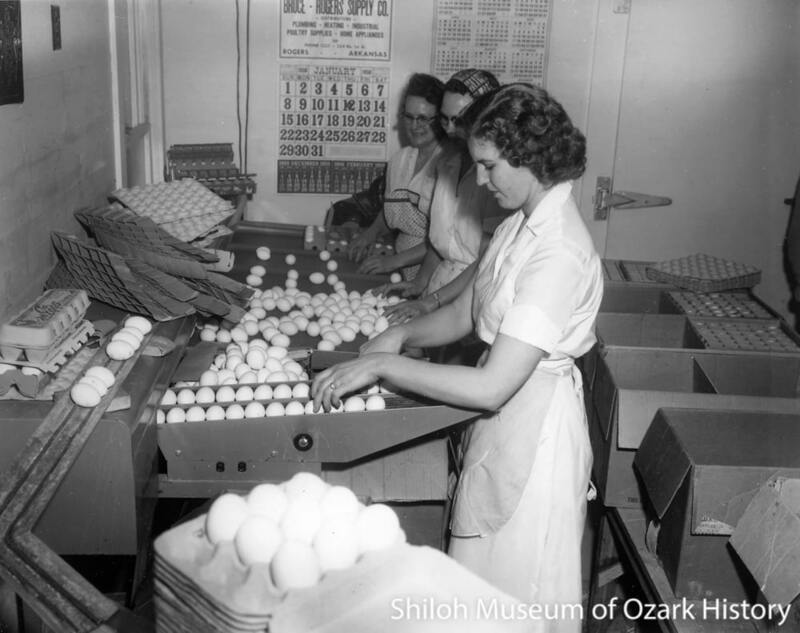 His work led to the birth of the area’s poultry industry and such companies as Tyson Foods in Springdale, Hudson Foods in Rogers, and Peterson Industries in Decatur. 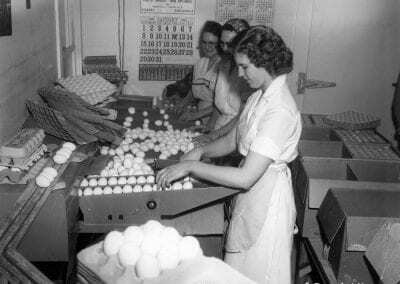 For a time the area was home to egg production companies like Fox De Luxe, demonstrating how important chickens are to the area economy. 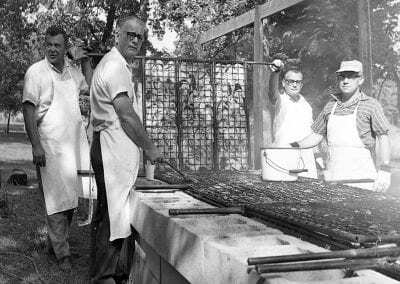 They’re also part of countless fairs and fundraisers, such as the spaghetti-and-chicken dinners at the Tontitown Grape Festival and the annual Decatur Barbecue. Other Commercial Livestock—Pel-Freez opened a rabbit-meat processing plant in Rogers in 1951, giving small-scale farmers a new source of income. Pel-Freez continues today, selling frozen rabbit meat to health-conscious consumers and manufacturing animal-based biomedical materials. At one time Benton County was the largest milk producer in the state. In the 1980s its roughly 200 dairies provided milk to such places as the Kraft Foods cheese plant in Bentonville and Hiland Dairy in Fayetteville. But by 2008 there were fewer than twenty dairies in Benton County due to high production costs and changing farm conditions. Today, as the farm-to-table food movement grows, specialty farming has increased. In Elkins the White River Creamery turns out 200 pounds of goat cheese each week while in Harrison, Berkshire Ridge Farm raises heritage-breed hogs for high-end area restaurants. 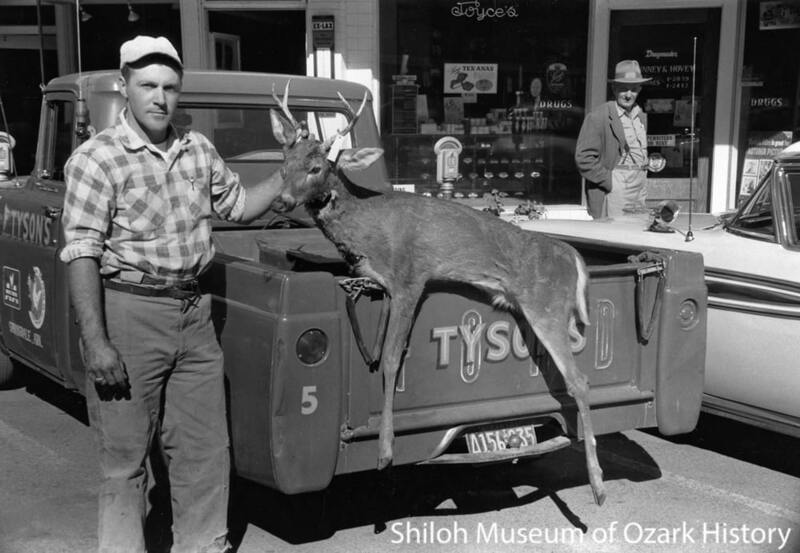 Wildlife—The Ozark Trout Farm was established at Johnson in 1932. Anglers could catch their fill of rainbows in a pond fed by the cold, clean waters of Johnson Springs. In 1970 the production was about 20,000 pounds of fish annually. Frog legs were a popular menu item back in the day. In the 1930s and 1940s Vol Brashears of Berryville raised and shipped live “giant jumbo” bullfrogs for pond restocking. Area boys earned spending money by catching the crawdads needed for frog food. In recent years a number of exotic species have been raised in the Ozarks including alpacas (for fleece) in Carroll County and foxes (for pelts) and emus (for meat, leather, and oil) in Madison County. Environmental Damage and Animal Welfare—Concerns have been raised about large-scale hog farming near the Buffalo River in Mount Judea. Some folks worry about water pollution from liquid waste-containment ponds at C&H Hog Farm’s operation. Others feel that, as long as the owners abide by the regulations, they should be able to do what they want on their property. Folks are also concerned about animals at industrial farms, arguing for such things as humane handling and housing. 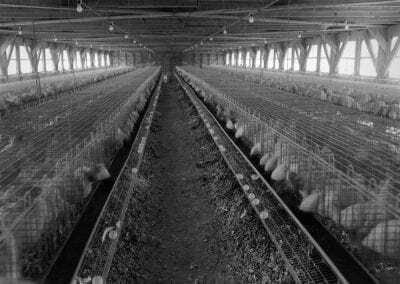 According to Tyson Foods, the company is working to increase the percentage of sows housed in open pens from 34% to 47% by the end of 2017. On a smaller scale, the folks at Mason Creek Farm in Fayetteville are breeding hogs that not only have better-flavored meat, but are less prone to being startled or stressed. 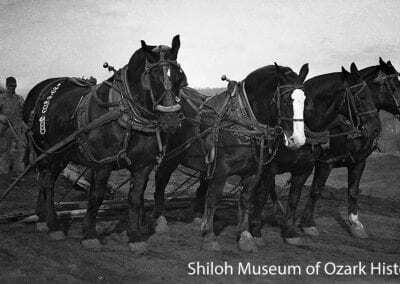 Farming—The strength of oxen, mules, and horses was used for all sorts of farm activities such as pulling stumps, plowing land, turning sorghum mills, and hauling wagons and equipment. 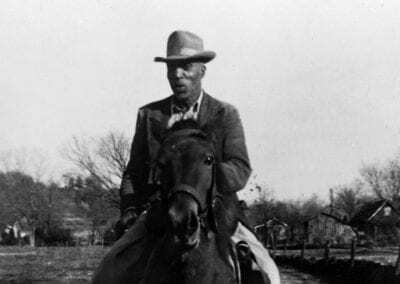 Henry Thompson of Madison County remembered a time back in 1869 when he got sleepy as he rode in endless circles while his horses’ hooves tramped wheat berries from the chaff and straw. Eventually gas-powered equipment like tractors took over many farm chores. The back-to-the-land movement of the 1960s and 1970s renewed interest in old-time farming with draft animals. That interest continues today with some of the area’s young farmers. Greedy Goats of NWA is a new business which uses goats to clear invasive vegetation such as honeysuckle and poison ivy from private residences and neighborhood parks, such as Wilson Park in Fayetteville. Logging—When the hardwood timber industry was in its heyday back in the late 1800s and early 1900s, horses and mules were used to “snake” (drag) heavy logs out of the forest, haul them on timber wagons, and bring portable steam engines and sawmills to the work site. 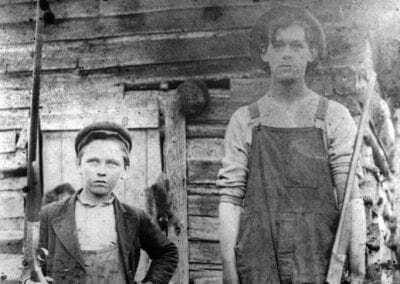 In 1861 timber baron Peter Van Winkle relied on the 34 mules at his sawmill near War Eagle, using teams of six to haul lumber. Modern-day lumbering operations, with their large, heavy vehicles, can harm the forest. In the 1990s Tom Coe of Gravette used ponies to pull logs weighing 900 pounds or so out of the woods without damaging trees or the forest floor. He enjoyed the work and the property owners whose trees he harvested appreciated his care for their land. Construction—During the 1800s and early 1900s, male residents of a certain age were required by law to do several days of road work each year or pay a fee to get out of it. 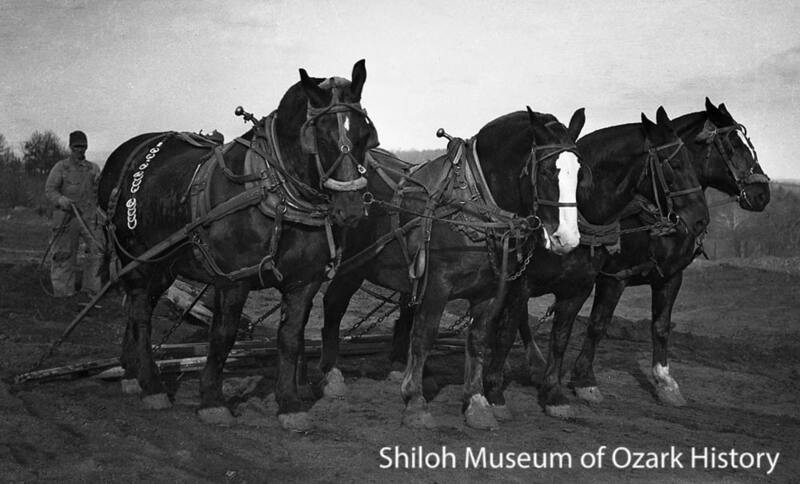 Teams of sturdy horses or mules were used to pull road construction equipment like scrapers or graders. These teams could be hired by the road overseer, but a man who brought his own team could lessen his work time. Even in the 1930s, when gas-powered equipment was available, draft animals were used to construct such places as Devil’s Den, Lake Wedington, Highway 71, and the Veterans Hospital in Fayetteville. Hunting—Hounds have been used to tree possums and raccoons, track scents, chase foxes, flush out quail, retrieve ducks, capture rabbits, fight bears, and protect livestock and their owners. Robert Winn of Winslow told of George Reed and his prized foxhound, “Sam.” One night when he was out foxhunting, Reed realized that Sam was sleeping by the fire rather than chasing foxes with the other dogs. As one fox was being driven closer, Reed is said to have picked up the dozing dog and thrown him almost on top of the fleeing fox. After a quick chase, Sam came back to sleep by the fire. Service Animals—Following World War I, seeing-eye dogs were trained to help guide German veterans who had lost their sight due to mustard gas. The idea expanded to the U.S. in the 1930s and grew. 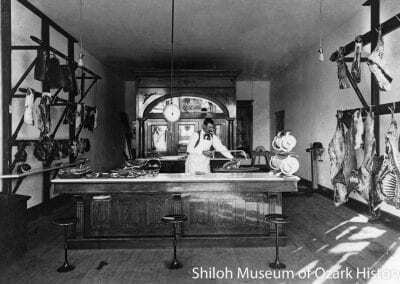 After Dr. George V. Harris lost his vision at age 30, he trained as an osteopath and opened an office on the Fayetteville square. 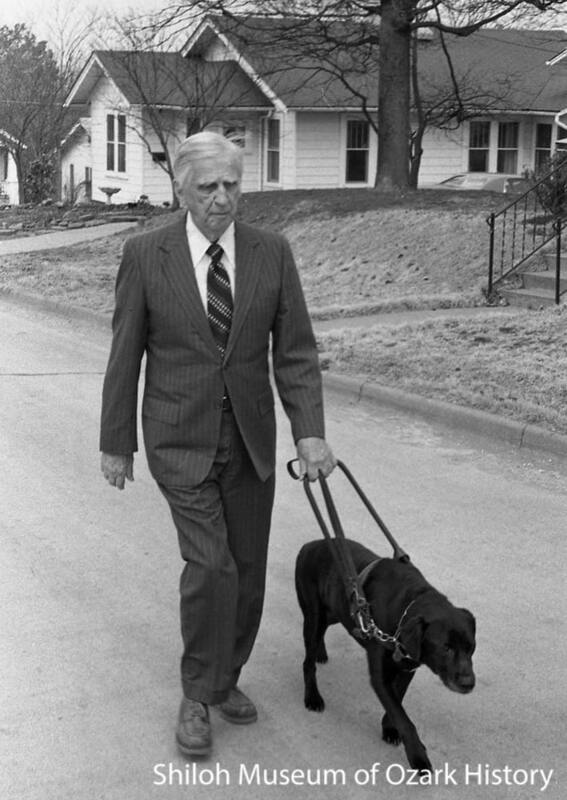 He lived nearby, choosing his house because it had sidewalks and curbs, necessary features for seeing-eye dogs to do their work. Specially certified dogs and cats are also used in such places as nursing homes, to soothe agitated residents and give them an opportunity to give and receive affection. Horses for Healing, a non-profit therapeutic riding center near Bentonville, helps riders with physical, mental, and emotional disabilities to improve such things as physical balance and flexibility and build self-confidence and social skills. A new program at the Benton County Jail pairs female offenders with shelter dogs, often pit bull mixes. The dogs receive much-needed obedience training while the women learn a technical skill, improve their morale, and gain leadership experience. To Serve and Protect—Specially bred and trained dogs are frequently used in police work to find missing people, sniff out drugs and dead bodies, and subdue suspects by biting them repeatedly. With the increased use of police body cameras and cell phone videos made by bystanders, such “canine apprehension” is coming under scrutiny. 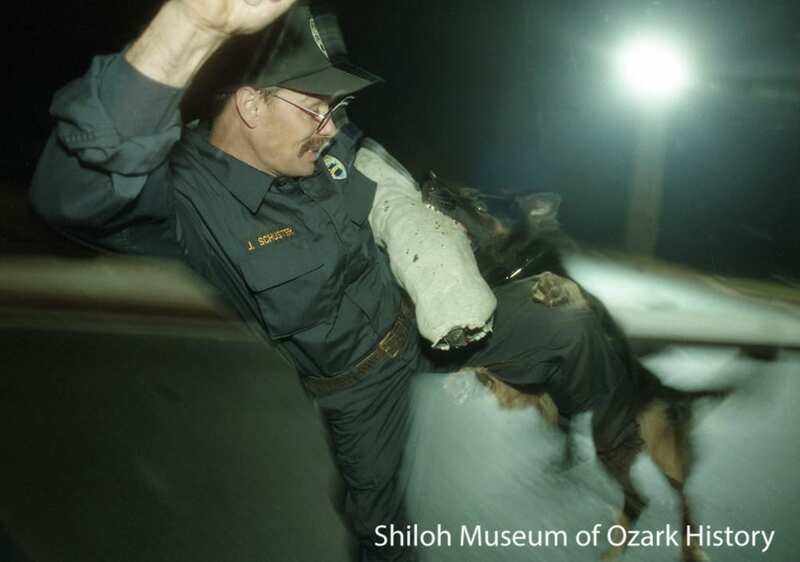 In 1997 the dogs in Fayetteville Police Department’s K-9 unit trained seven hours weekly. Their work was rewarded with lots of praise and a special ball. 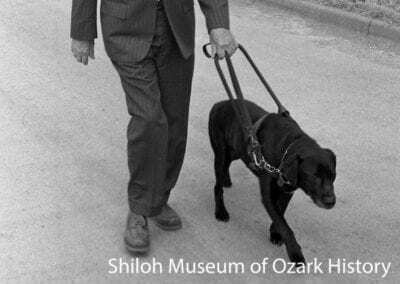 “Gilligan” became Northwest Arkansas’ first arson dog in 1997, trained to sniff out the presence of hydrocarbons and accelerants used in intentionally set fires. While the golden Labrador’s home base was the Rogers Fire Department, he served fire companies in Benton and Washington Counties. Hacks, Wagons, and Buggies—For shorter journeys, small hack wagons driven by independent operators were used to take paying passengers from the railroad depot to their hotel. In the early 1900s the “Summit Hack” took passengers to the Summit Hotel in Winslow, when the town was a summer resort. In Zinc, the open-sided wagon was known as a mud wagon, perhaps because of its exposure to the elements. Coy Logan of Boone County told the story of several sleepy children who were left in the hay that lined the bed of their parents’ farm wagon during a long church service. Some of the local youth decided to switch the children around, causing confusion for parents when they got home. Buggies were used by many folks when they traveled to church, to town for supplies, when visiting with neighbors, or during leisurely rides when a young man was courting his gal. Today horse-drawn buggies take folks through downtown Eureka Springs or around the Fayetteville square to see the lights at Christmastime. 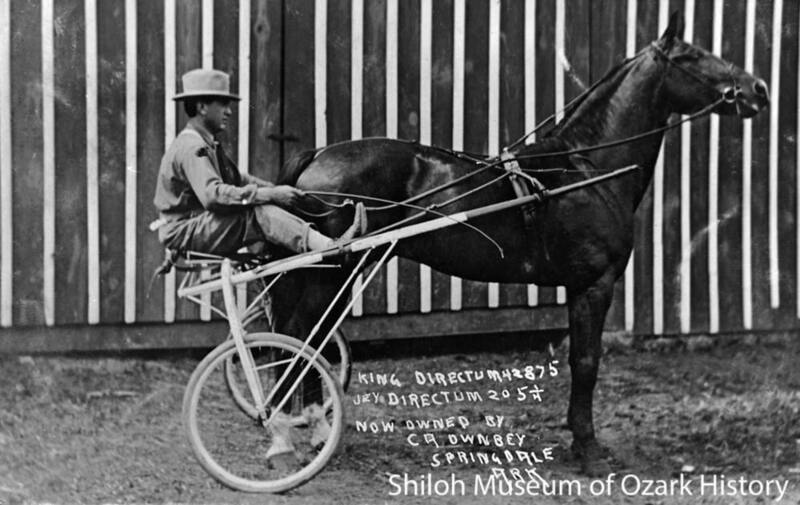 Joy Ride—In the late 1800s hotels and livery stables had riding horses available for visitors at the health resort of Eureka Springs. Groups of sightseers took “tally-ho” (carriage) rides to popular picnic spots like Sanitarium Lake (now Lake Lucerne). Drawn by a team of four horses, the coach could comfortably seat about thirty-five people. A herd of 29 donkeys was available at the Summitt Hotel in Winslow for guests to ride, if they could—the donkeys had a will of their own. Before a horse can be ridden, it must be “broken” or trained so it is safe to handle and able to follow commands. 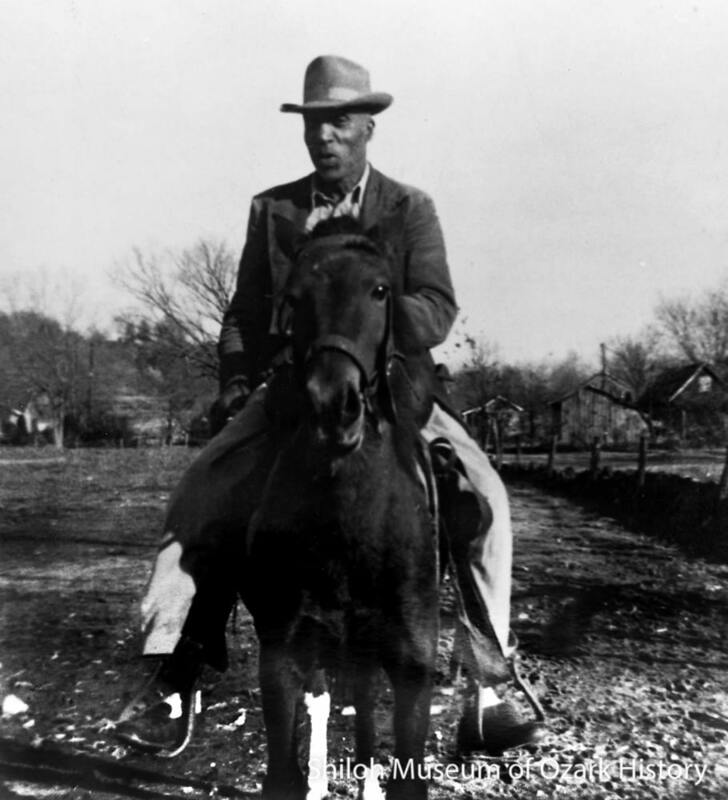 Noted cowboy and “horse breaker” Otis J. Parker of Fayetteville worked with horses his entire life, training saddle horses and gaiters. Riding continues to be a favorite pastime today. Several area trails are horse-friendly, including one at Lake Sequoyah in Fayetteville. House Calls—Dr. Will Mock of Prairie Grove was given a registered saddle horse, “Roxanna,” by his parents after he graduated from medical school. He started his career riding horseback, carrying medicine in his saddlebags. From there he graduated to a horse-drawn buggy and then to a double buggy with two horses. Later horses were named “Woodland Wilkes,” “Bill Nye,” and “General Forrest.” After the introduction of the automobile, Dr. Mock “kept his saddle horse as his standby.” Circuit riders—clergymen who traveled from church to church to preach the Gospel—frequently traveled by horseback on their multi-week journeys. 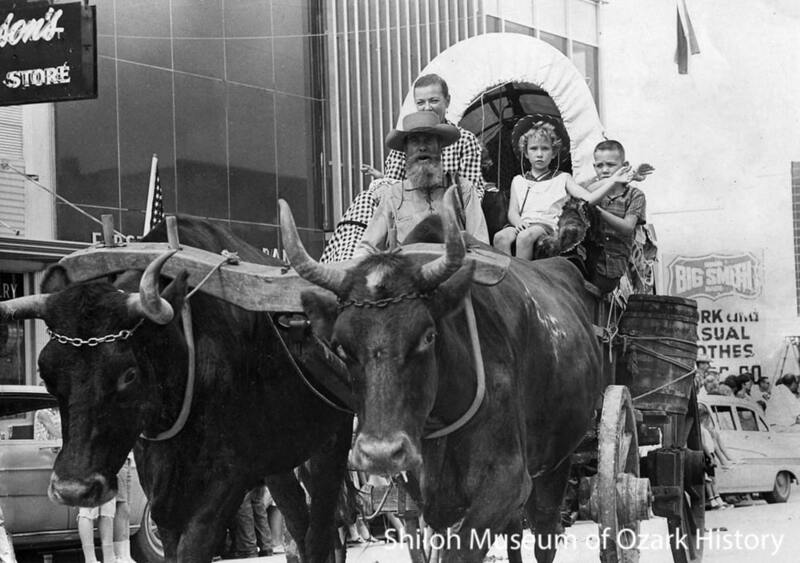 Wagons Ho—In 1951 the Northwest Arkansas Cavalcade was formed to promote the Rodeo of the Ozarks throughout Arkansas, Oklahoma, and Missouri. Local riding club members traveled hundreds of miles, stopping at towns along the way to talk up the rodeo and sell tickets. Martha Collins remembered that, during one early Cavalcade ride to Fort Smith, a heavy rain forced the riders to swim their horses through flooded Johnson Creek. Since 1977 the Harrison Roundup Club has sponsored the John Henry Shaddox Memorial Wagon Train. Participants enjoy the slow pace and the companionship of the other riders as they spend five days traveling 108 miles on rubber-wheeled wagons from Harrison to the Rodeo grounds in Springdale. Day at the Races—Horse races were a popular event at county and agricultural fairs in the late 1800s and early 1900s. One early race was held through the streets of the Fayetteville square, as part of Washington County’s first fair in 1856. At a fair in Rogers in the early 1900s, the “county trot” featured horses ridden by their owners, all locals. Local newspaperman Erwin Funk was impressed with J.T. Weathers, a rider who was “quite a curiosity among horsemen for he neither smokes, drinks, chews nor swears.” Three cone-shaped stone-and-cement markers used to mark the track’s boundaries still stand near downtown Rogers. By the late 1930s, a group of Bentonville businessmen built an oval racetrack on land that is now Melvin Ford Park. It had twenty stables, a corral, and a 1,200-seat grandstand complete with a red-clay tile roof. The scene of horse races and shows, it also gave locals a place to train and ride. 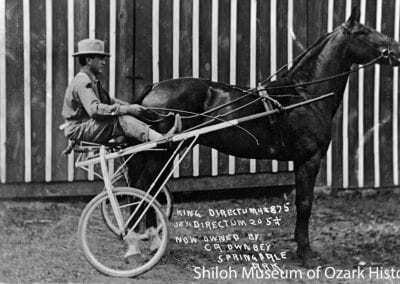 The Ozark Downs racetrack was built near Sonora in 1965 by a group of quarter-horse breeders and trainers. 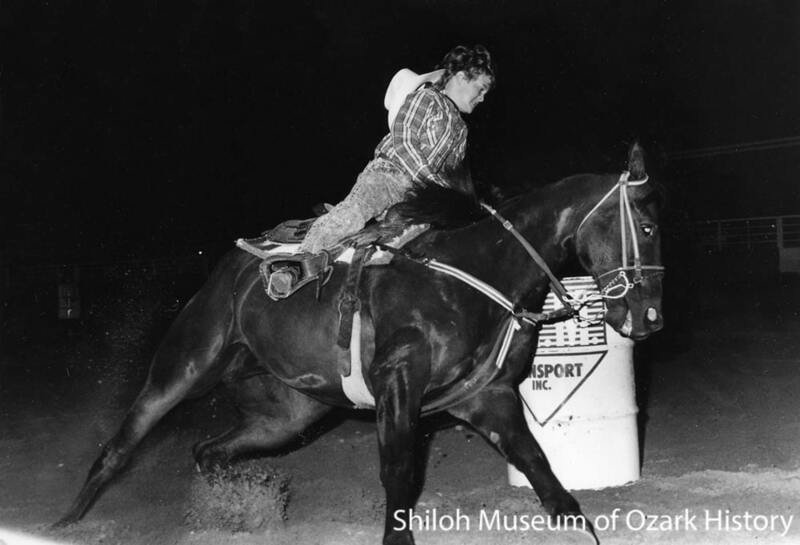 At the time it was the only track in Arkansas sanctioned by the American Quarter Horse Association. It featured an oval track, bleachers, and a 100-stall, fireproof stable. The track operated off and on into the 1970s. Rodeo Time—Buffalo Bill’s Wild West Show came to Fayetteville in 1898 and featured cowboys riding and roping animals. In 1945 Thurman “Shorty” Parsons and Dempsey Letsch, along with others, began the Rodeo of the Ozarks in Springdale. Animals’ natural ability to run, buck, and canter were featured in such feats of skill as calf roping, saddle-bronc riding, and performing acrobatics while atop moving horses. Barrel racing relies on the skill of the rider and the athletic ability of the horse to run a cloverleaf pattern around barrels as fast as possible. Rare Breeds—In the 1980s Circle 7 Riding Stables in Jasper was home to sixteen Lipizzaner horses. These rare, gray horses from Austria are known for their “airs above the ground,” specialty leaps and turns originally derived from combat movements. 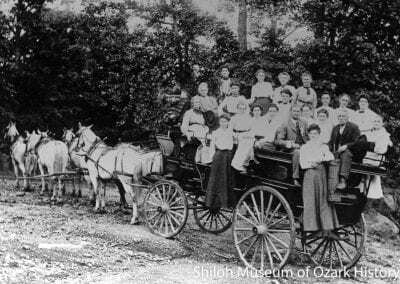 The Ozark Lipizzaners were trained as riding horses and to pull wagons. For a time in the 1970s the Peruvian Paso horse was bred and trained at Rancho de la Ozarks in Harrison. Descendants of the horses of Spanish conquistadores, these saddle horses are known for their smooth, cat-like gait. They were once used in bull fighting. Uncommon Athletes—Dogs are natural athletes and their skills are used when playing Frisbee or during agility events such as crawling through tunnels and jumping over barriers. The Pea Ridge Mule Jump got its start in 1988 when a group of raccoon hunters began bragging about how well their mules could jump fences, a necessary skill while out riding in the woods. During the contest the participants have three minutes to verbally coax their mules over a wood barrier, set at varying heights, without knocking it down. The winner in the professional category is awarded a $1,000 prize. Mules also compete in barrel-racing and pole-bending events, where a mule is ridden weaving in and out through a series of poles set in a straight line. Animal Parks—In 1960 Freda Wilmoth bought three bison for her husband Ross, who was interested in breeding them with beef cattle. From there they began raising deer and elk and then more exotic animals like peacocks, monkeys, lions, and leopards. Interest grew and visitors began to arrive, leading to the opening of the Wild Wilderness Drive-Thru Safari in Gentry in the mid-1970s. Today, critics and federal agencies cite issues with animal care, housing, and visitor safety. Snake World opened in Berryville in 1992, serving visitors and schoolchildren. At first it largely featured venomous snakes but now includes non-venomous snakes, reptiles, tropical fish, and even a few guinea pigs. 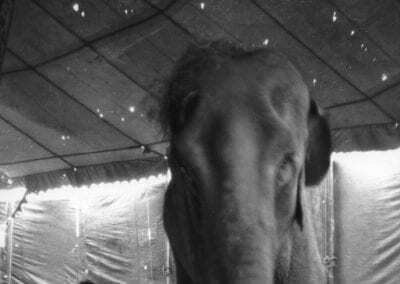 Parades—In the late 1890s an elephant paraded through downtown Fayetteville to advertise the Barnum and Bailey Circus. More often, horses are a mainstay of parades. In 1901 horses pulling flower-covered buggies greeted the arrival of St. Louis & North Arkansas Railroad’s first train in Berryville. At the 1926 Apple Blossom Festival in Rogers, Bentonville’s float, pulled by a team of eight white horses, won first place. Riding clubs are often part of the Rodeo of the Ozarks parades in Springdale along with a miniature Purina Chow wagon pulled by ponies. Even oxen got in on the act, pulling a pioneer wagon in at least one rodeo parade. Show Time—Farm animals have always been a highlight of county fairs. Livestock and horse races were featured on the Fayetteville square during the first Washington County Fair in 1856. Today’s members of area 4-H and Future Farmers of America clubs spend all year learning to care for and groom such animals as rabbits, chickens, goats, dairy cattle, turkeys, and sheep, which are proudly displayed at the fair. Some animals are sold during the Junior Livestock Auction. 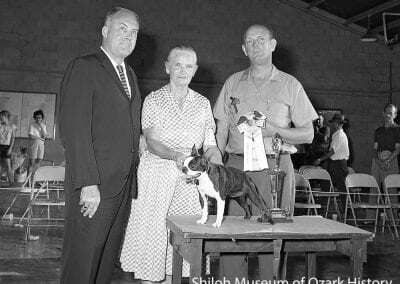 The first dog show in Washington County was held at the county fair in Fayetteville, September 1937. Prizes included eighty cans of dog food and an Irish Setter puppy. 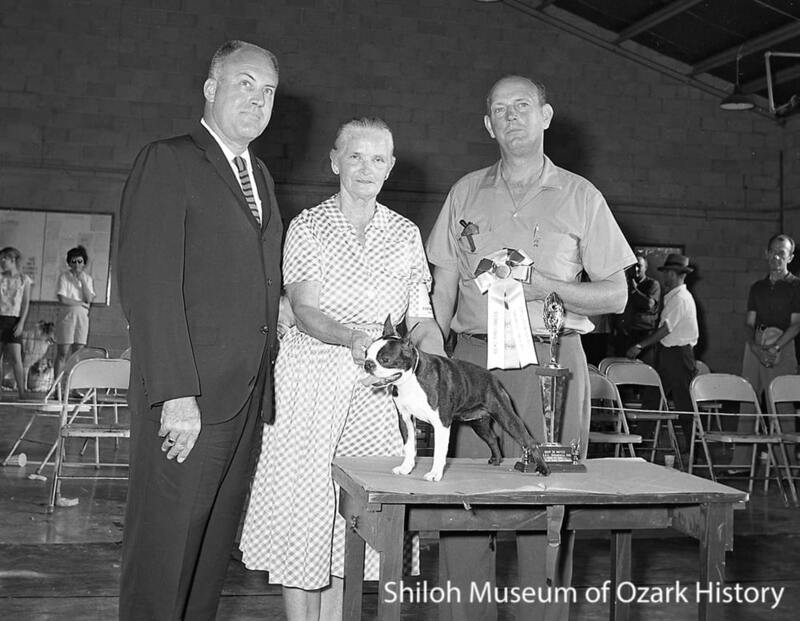 The Northwest Arkansas Kennel Club formed in 1961, in part to promote dog raising and breeding. It later added obedience trials to the show program. 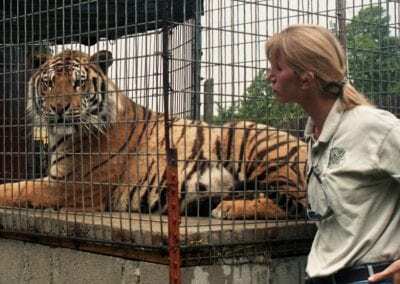 Sanctuary—Some owners realize too late that their exotic “pets” are dangerous or hard to care for. Lucky Birds Unlimited Parrot Rescue in Siloam Springs shelters exotic tropical birds whose owners can’t maintain their special diets or provide the necessary attention these long-lived animals need. 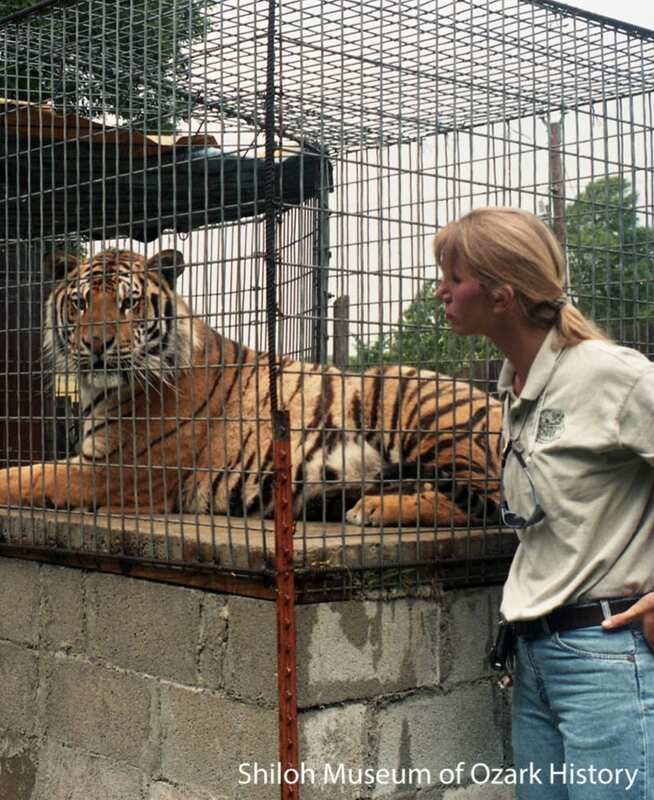 Since 1992 Turpentine Creek Wildlife Refuge has cared for “abandoned, abused, and neglected” big cats like lions and tigers, including “S. A.,” a 700-pound Bengal tiger who stood guard outside of a methamphetamine lab in San Antonio, Texas. He was kept hungry to encourage him to be savage. The sanctuary was located in Northwest Arkansas, in part because of the area’s meat processors. In 1998 Tyson Foods supplied 1,000 pounds of raw meat daily. Pets—Dogs and cats are the most popular animals kept as pets, but there are fans of birds, fish, rabbits, and rodents, too. 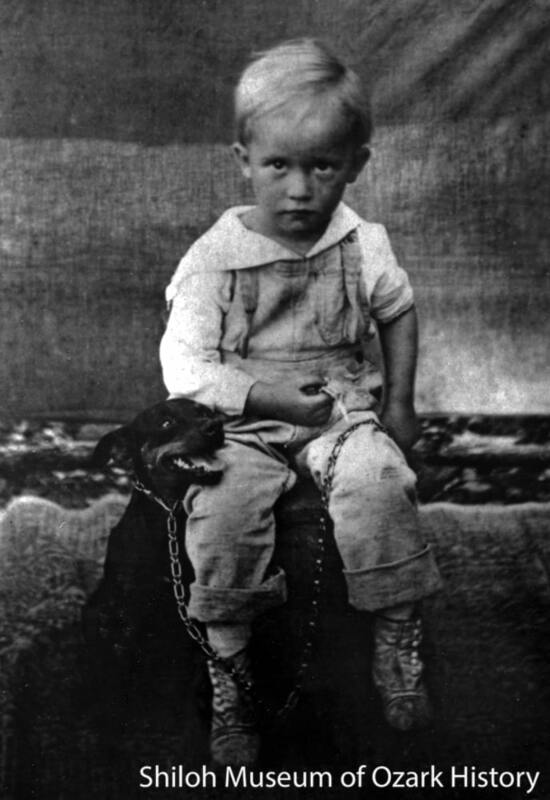 When Wayne Martin of Pettigrew was three years old in 1938, he was given a dog. “Tip” and Wayne “grew up together. …From the time I was ten years old there was nowhere I couldn’t go without a .22 rifle in one hand, a fishing pole in the other, and Tip alongside me.” Eventually Wayne had to use that rifle to put down an ailing Tip. 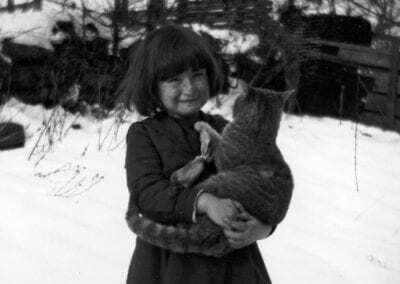 Because Cornelia Wein of Winslow had a soft heart for animals, her neighbors took advantage of her, dropping off their unwanted cats. She fed them all with the help of “Maudie,” her cow. 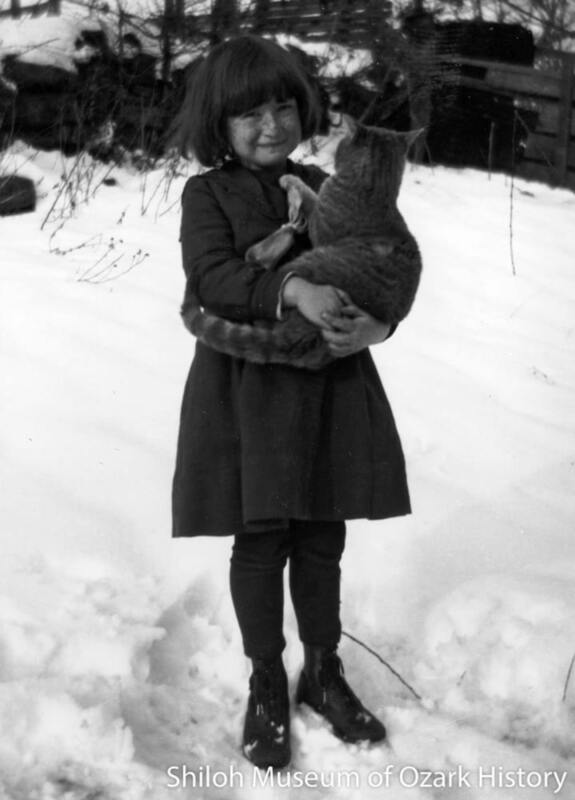 According to Robert Winn, when the cats saw Mrs. Wein with the milking pail, the cats were “purring and licking their chops in anticipation of the warm, foaming milk that soon was to be supper.” Sometimes folks keep unusual pets. When she was a child in 1920, Pauline Jackson Thacker of Aurora kept “Petty,” a chicken which had lost its feet to frostbite, but still managed to follow her around. In the 1980s pet llamas were bred at the Hickory Hill Llama Ranch near Kingston. For a time in the 1990s Vietnamese pot-bellied pigs were popular and local cities had to decide whether they were pets or livestock. Dangerous Dogs—Dogs and other animals with rabies were feared because, if the rabies was transmitted via saliva to humans, it would lead to a painful death. In 1894 William Etris of Bentonville was bitten by a rabid puppy. 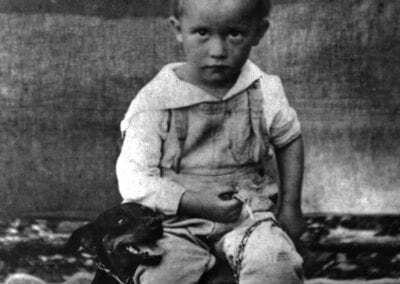 Before his death he became “perfectly wild, it being necessary on one occasion to tie him in bed.” William’s mother Martha died the following year, “pining over the sad fate of her dear boy.” Feral dogs can form packs which may maul or kill livestock like sheep and chickens. Some folks are attacked by dogs while out jogging or bicycling. Today, one bicycling route in Washington County is so notorious for its threatening dogs that it’s known locally as “Dog Loop.” In an effort to deal with these problems, the Quorum Court recently passed an ordinance outlining how the Sheriff’s Office can declare animals “dangerous.” While it’s a step forward, without responsible owners who keep their pets in enclosures and vaccinated against rabies, people and animals are still in danger. Shelters—The Fayetteville Humane Society was formed in 1946 to establish an adoption program and humane euthanasia (kill) methods. Prior to that, abandoned or stray dogs were placed in a large, crowded pen regardless of size or medical condition. 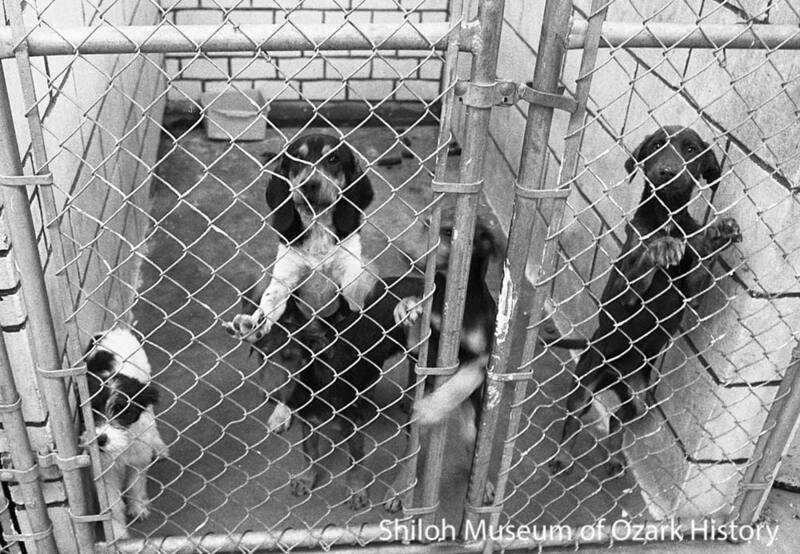 Anyone who wanted a dog just took one, “no questions asked.” In the 1980s and 1990s shelters run by the cities of Springdale and Rogers were accused of overcrowding, poor sanitation, limited food supplies, and lack of proper solutions for euthanasia. 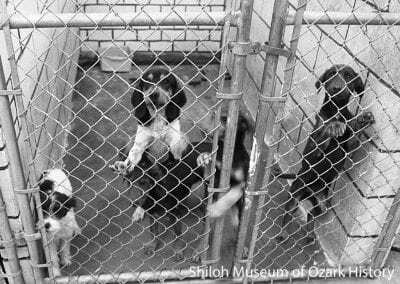 In January 1980 the Springdale shelter dealt with an overcrowding issue by putting down 68 dogs and eight cats in a single day. As part of a new program, in 2017 over 200 dogs and cats were sent from the Washington County animal shelter to no-kill shelters in other states. While this helps save some animals, it leaves fewer animals for local adoption. During the county’s recent Pet Palooza event, 584 people came but only thirty animals were available for adoption.